You are here: Home / Blog / It's time - GiveBIG with Beth Rodden! It's time - GiveBIG with Beth Rodden! GiveBIG starts today! Make sure to give to The Mountaineers! I grew up in the flatlands of the Central Valley of Northern California. A pretty “typical” upbringing surrounding school and team sports during the school year. My parents made a huge effort to get my brother and I into the Sierras during the summertime and expose us to the wonders and beauty of the natural world. I started climbing at our local climbing gym in high school and it forever changed who I was and how I would lead my life. I’ve since been fortunate enough to make my passion for climbing my profession and structure my life around spending time and climbing in the mountains. I became a first time mother two years ago. We didn’t read many books on babies or motherhood (okay, we didn’t read any) and pretty much went into blind as most new parents do. 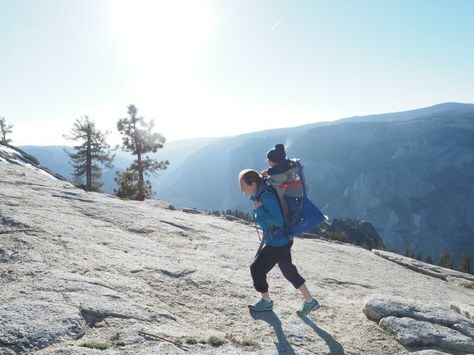 But if there is one thing that I knew from the beginning, is that I wanted to expose our son to the mountains and have him grow up and spend as much time in them as possible. And so far, he’s spent the majority of his life exploring, wandering and playing in the Sierras. I didn’t have something like The Mountaineers around when I was growing up, but I was lucky enough to have parents who valued the mountains and all of their teachings and offerings. I couldn’t imagine my life without access and knowledge of how to play and preserve our natural environment, nor could I imagine our son’s life without it. The Mountaineers provides the opportunity for youth, regardless of ability to pay, and families to experience something that they wouldn’t have been able to before. They give them the tools and ability to see, touch, and feel all the wonders that nature provides. And without the younger generation having the respect and love for our natural world, there will be no one left to fight to preserve and protect it. Check out this great video highlighting The Mountaineers’ Mountain Workshop program, which is designed to get underserved youth to experience the outdoors. Time is running out! Donate $50 to GiveBIG today to support The Mountaineers’ efforts to get more youth to experience the outdoors.